More than a week since my last post! I’m still playing The Second Sky, but I’ve slowed down considerably. I don’t play every day, and when I do, I consider it a good session if I finish even one room. A far cry from my reaction to The City Beneath. It’s all because the puzzles — or at least, the endgame puzzles, which are still somewhat optional unless you’re stubborn enough to insist on the best ending — are so much harder this time around. Before this game, Journey to Rooted Hold was definitely the most difficult, even if you ignore the Challenges that consumed so many days on this blog. And given how much easier Gunthro was than The City Beneath, I really wasn’t anticipating such an extreme reversal. But it makes sense. We’re at the final chapter of the final chapter. If you’ve come this far, you’re an expert on everything the puzzle designers can throw at you. That means they can freely exploit minutiae like movement order. See, every monster has a number, which you can see when you right-click on it. When you move, the monsters move in order from lowest to highest, and this can have effects on what happens. 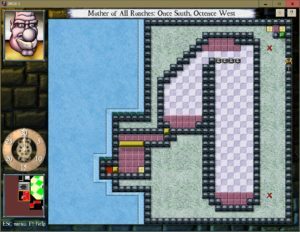 Consider a row of Roach Queens lined up against a wall, as in the screenshot. Roach Queens run away from the player, and prefer north/south to east/west movement when they’re blocked from moving diagonally. What happens when you move one square to the north? You can’t answer that from the screenshot; there isn’t enough information. If they’re arranged from east to west, such that the easternmost one moves first, then each roach will simply move one square southwest, except for the last, which will have no empty space to move into. The next turn, the same will happen again, except the last two will be blocked, and so forth until they’re all hugging the western wall. But if they’re arranged from west to east, the leftmost one will move south first, then the next one will be unable to move southwest and instead move south, and so forth. They’ll remain in a horizontal row and march south in lock-step. The latter is in fact what happens in this puzzle, and it’s pretty easy to keep the roaches neatly ordered as you chase them south, then back north, then southwest, timing your actions to their spawn cycle. Which is good, because you need them in a row at the very end, for reasons I won’t go into. But before you get there, the geometry of the room acts against you, splitting the first and last roaches out of the line. By the end, you need to get the roaches in a different order, probably 3124, presumably by using the right-hand walls in just the right way. The uncertainty of my words comes from the fact that I haven’t yet solved this puzzle. I’ve known since the very first DROD that movement order can make a difference, but I never needed to pay attention to it precisely. “Move these guys against walls some to get them to shuffle around” was always adequate. Here, I don’t just need to know movement order, I need to deliberately manipulate it. And that’s what this chapter is like. One of the larger (but not the largest) of the very large levels in The Second Sky‘s eleventh chapter is all about Fluff so let’s talk about Fluff. Fluff is depicted as cottony white clouds, but these clouds are as impassible as any other obstacle. It’s like tarstuff, in that it needs to be two tiles thick at all points, and when it isn’t, the thin parts break off into monsters, called Puffs. Or maybe it’s wrong to classify Puffs as “monsters” — they don’t count as such for level completion. Sometimes completing a Fluff room means fleeing just before the massed Puffs overwhelm you. Which they can do, because, like Wubbas and Serpents, you can’t hurt them with your sword. Oh, they’re not unkillable. Explosions will take Puffs out, and if you have access to a pushing weapon, you can crush them against walls or obstacles, including other Puffs. Similarly, Fluff can’t be cut with sharp weapons, but only with blunt weapons or explosives. But not all Fluff rooms provide these things. Instead, the chief weakness of Puffs is that they’re slow. They only move once every five turns. They’re the only creature with this property, and it completely changes how you deal with them in puzzles. Among other things, it means they can’t cross Hot Tiles unless they’re pushed. Leading a Puff to an opportune spot involves a lot of waiting, and often you have to deal with other things while you’re waiting, so it’s more like just making sure you wind up in the right place relative to the Puff after every fifth turn. Fluff, I say, is essentially a tarstuff, but it’s a peculiar form of tarstuff. It’s the only form of tarstuff that flies; in both Fluff and Puff forms, it can go over pits and water, and doesn’t trigger pressure plates. Also, there is no such thing as a Fluff Mother. Instead, there are vents, an architectural feature that cannot be killed. If a vent is covered by Fluff, then that Fluff expands every 30 turns by the normal Tar Mother expansion rules. If it’s not, then the vent simply emits a Puff instead. But vents tend to become covered by Fluff over time, because of Fluff’s most notable unique feature as a tarstuff: it can reform. Puffs adjacent to Fluff can merge with it. If four or more Puffs gather in a tar-stable shape, they meld into new Fluff. I think the most important thing about Fluff, though, is that it hates all life. Puffs are the only thing that will actively pursue and kill both the player and the monsters — which is another good reason for excluding it from the “monster” category, because they don’t kill each other. (Slayers will sometimes kill monsters in pursuit of the player, but only because they’re in the way. They don’t hunt down monsters the way Puffs do.) There are multiple rooms with no monsters other than Puffs and the passive and immobile Brains, where your goal is to bring them together. The great thing about all these unique features is that so many of them can be used in puzzles as either obstacles or solutions, depending on context. Puffs being slow is a good thing, until you need to get them somewhere within a time limit. Puffs attacking monsters is a good thing, unless you need the monster alive to weigh down a pressure plate or something. Puffs forming into new Fluff is good if you need to create an obstacle to keep that monster standing on the pressure plate, but bad if it blocks your only way out of the room. Vents are bad if they fill the room with inescapable Fluff, but good if they’re the only way to kill monsters. This is rich puzzle fodder, exactly the sort of thing DROD thrives on. If a Puff dies over water, it lets out a burst of cold that freezes its tile into thin ice, which is equivalent to a trap door: you can walk on it once, but it collapses as you step off. I learned this in the first Fluff level, but there’s so much about Fluff that’s peculiar that I had completely forgotten this one detail the next time I needed it. I think this is the first time I’ve found the monster descriptions in the help menu really useful. The Second Sky: The Final Chapter? The Second Sky is the largest DROD by a very comfortable margin. That much is clear to me now. It’s like the designers, knowing that this was going to be the final episode, decided that they had to use all their ideas now. The thing is overflowing. Previous episodes grouped rooms into levels, but TSS additionally groups levels into chapters. I suppose that’s essentially what Gunthro and the Epic Blunder did, too, but this time it’s more formalized, and there are more chapters. A chapter can be linear, going through a sequence of levels one after the next, or it can be open, just giving you access to a bunch of new levels and letting you flit between them as you like. I’ve been doing a lot of such flitting about, because the puzzles in this game aren’t just numerous, they’re also very hard. I said earlier that I was hitting the end of the game, and just taking some time to finish up side-quests before finishing it off. The game encouraged this notion by providing an isolated campsite where I could go to wait out the Turning whenever I was so inclined. Obviously I wasn’t going to do that — not without finishing everything I had started! So over the past few days, I have taken care of unfinished business, even going back and clearing out the Tar Recycling Annex, which has nothing to do with Beethro’s goals at this point in the game but which does have a RCS stamp for my collection. It was here that I needed a bit of a nudge from the Caravel Forums hint boards, but only for one of the four rooms I had previously given up on. And, having done all that, and having set the plot in motion again, I find that there’s an entire additional chapter, with some really big levels. I’m not as near the end as I had thought. The campsite is still there, in case I want to give up, but nah. Without going into too much detail, Beethro’s plan for saving the surface-dwellers from the Turning in the chapter I just finished involves posing a really difficult question to the Truth Vessels, one that they’ll need to keep spawning more Truth Vessels sorcerer’s-apprentice style to answer. It’s another of those metaphor-for-game-design moments, Beethro trying to come up with an adequately difficult puzzle for a whole bunch of other people to solve. And there’s a neat bit of resonance there, because if the player decides to end the game early, it means Beethro gives up on looking for really tough puzzles for his audience, and the consequence for the player is that you miss out on a bunch of really tough puzzles. We are the Truth Vessels. It’s a habit that’s become as regular as clockwork: There’s a Steam sale. I buy some cheap stuff. Among the cheap stuff is some kind of Puzzle Quest imitation, which eats at least a day of my life. Even if it’s not particularly good, even if I have other games I’d rather be trying out in my limited time off, I wind up compulsively just-one-more-leveling to the exclusion of all other activities for a while. The one difference this time around is that I didn’t actually buy FreeCell Quest in the sale; it was in a Humble Bundle earlier in the month. FreeCell, for all that it’s a form of solitaire, is at heart a puzzle game, and FreeCell Quest is a collection of intentionally designed FreeCell puzzles. The quest aspect adds context and flavor to that base, but skimps on story. You get a fantasy map to walk around on conquering cities by playing FreeCell at them, and that’s pretty much it for plot. The game says you’re “liberating” the cities from some evil force rather than conquering them, but in the absence of any information at all about the enemy, I’m taking that as a euphemism. As it is, all you every see of each town, fort, monastery, or other point of interest is a game of FreeCell, and in some cases a shop menu for buying upgrades. Mechanically, though, it turns out to be one of the more satisfying entries in the Puzzle Quest-imitation genre. It actually goes to the effort of making the puzzles meaningfully different, for one thing. Each location has stats you can view on the map: how many columns, how many cards (from half a deck up to two decks shuffled together), how difficult the shuffle (which seems to have to do with whether the kings or the aces are in front). We quickly notice that these correlate with the location’s type: villages are wide, forts have difficult shuffles, etc. The number of cards simply increases across the board as you get farther from your initial location. It’s very easy to see these qualities as abstractions of the locations’ physical properties. That’s the kind of reading-into that I like to see in these games. Battles are asymmetrical. The player’s stats are hit points and mana, which increase as you level up from winning battles, and defense, which increases as you buy better equipment with money from winning battles. The enemy doesn’t have hit points; you win a battle simply by sorting all the cards onto the foundations. Every once in a while in real time, the enemy attacks you by casting a spell from one of the cards that currently can’t be moved; if you can free the card before the spell is fully cast, the attack is canceled. You can cast spells as well. The cheapest spell, costing a mere 1 mana, is the Undo spell, which lets you take back a move. At first, I thought of this spell as theoretically useless: sure, it’s handy when you make a mistake, but an ideal player wouldn’t make mistakes. But it turns out to be very good for defense! Often, an attack will come from a card that’s buried under something you don’t really want to move, because the only place to move it to is an empty slot that you have other uses for. So what you do is, you move the cards to cancel the attack, then Undo. The attack remains canceled. There’s also a spell you can cast to just cancel any attack without moving any cards — this is, in fact, the spell I cast most frequently, because things are often trapped too deep for the Undo trick. But when you can pull it off, the Undo trick is significantly cheaper. Most of your spells are about moving cards. For example, there’s a spell to move a card one spot forward in a column, a spell to rearrange an entire column at random, a spell to push kings all the way to the back. My favorite spell is one that plucks out a card that can be placed on a foundation from anywhere on the board, but it’s very expensive to cast. These are the sorts of spells I was wishing for in Runespell: Overture, ones that affect the mini-game layer instead of just the RPG layer. Their chief purpose in the game is to let you attack puzzles you’re not otherwise ready for by choosing to spend lots of mana instead of figuring out how to rearrange things manually. That’s important because of the way the game limits your access to cells. Ordinarily, FreeCell gives you four cells that you can stash individual cards in. FreeCell Quest starts you off with only one, which means only the smallest and easiest puzzles are doable without the aid of spellcasting. Additional cells, to a maximum of six, must be earned through conquest. The game dresses this up in some additional complexity, but what it comes down to is that the number of cells you have correlates with the number of distinct locations you’ve beaten. As a result, cells are grindproof. You can always get more XP and money by replaying locations. Sometimes the game even forces you do to this, declaring that a town you’re passing through has fallen to the enemy and has to be re-liberated. But you only make progress towards a new cell when you beat something new. Cells are the most important upgrade there is, more powerful than health or mana, so that keeps driving you into new and more difficult territory, which forces you to take advantage of your spells to compensate for the cells you don’t have yet. In short, there’s some good thought behind this game. Despite a day and a half of obsessive play, I haven’t beaten it yet — it’s pretty long. But I’ll probably keep coming back to it until I do.